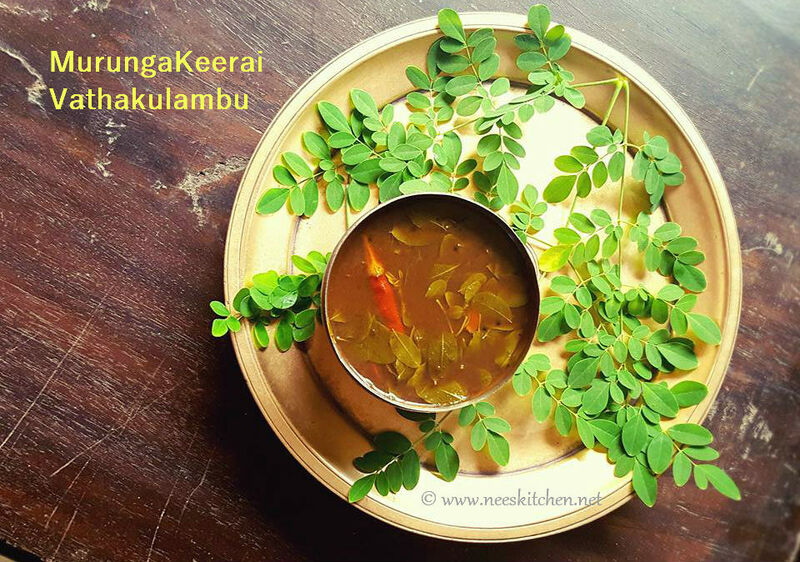 Murunga Keerai Vathakuzhambu | Moringa Leaves Kuzhambu is a regular vathakuzhambu recipe with moringa leaves as the primary ingredient. It tastes similar to drumstick vathakuzhambu. Moringa Leaves are available throughout the year and ideal during the season where drumstick is not available. 2. Prepare the tamarind extract by adding 600ml water to tamarind (lemon size) and diluting it. 3. The Murungakeerai Vathakuzhambu |Moringa Leaves Kuzhambu cooking process starts with tempering first, take a heavy bottom kadai and add 4 teaspoons of sesame oil. 4. Once the oil is hot, add mustard seeds and as they splutter, add methi seeds and fry for few seconds. 6. Add dry chili & curry leaves to this mix and fry them well. 7. Transfer this to a kalchatti / soap stone pot or a heavy bottom vessel ideal for cooking soups. 8. In medium flame gas add the diluted tamarind extract, turmeric , sambar powder and salt. 9. Add 2 teaspoons (or upto 6 teaspoons) of sesame oil to this mix. 10. Bring to a boil and cook on high flame for 3 minutes and medium flame for 7 minutes or till the raw smell of tamarind disappears. 11. Switch off the gas and add the moringa leaves and close with a lid. 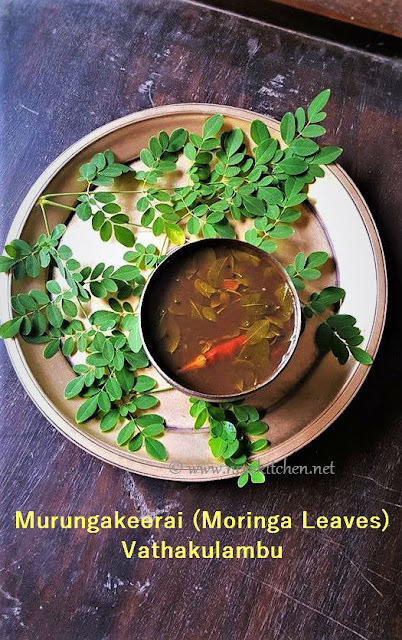 Moringa leaves get cooked in this heat. Do not cook the leaves when the gas is on else it would turn bitter. 12. Allow the moringa leaves to infuse for at least 10 minutes before serving with hot rice.